Brighten your meals with the tasty tang of homemade vinegar. Chef Bill Collins shows you how to make your own vinegars, including wine, apple cider, malt, white, and rice vinegars, and then flavor them with herbs for exactly the taste you want. You'll also learn how to use your custom-made vinegars in everything from a basic Italian salad dressing to Asian coleslaw, sweet potato salad, caponata, sauerbraten, caprese sliders, pickles, chutneys, and even chocolate chip cookies. Vinegar is the secret ingredient that adds bright flavor and sparkle to countless dishes. Personal chef and cooking instructor Bill Collins offers step-by-step instructions for making your own vinegars and developing flavor infusions for purchased or homemade vinegars. Enjoy your creations in refreshing shrubs (a vinegar soft drink) and more than 30 delicious recipes. 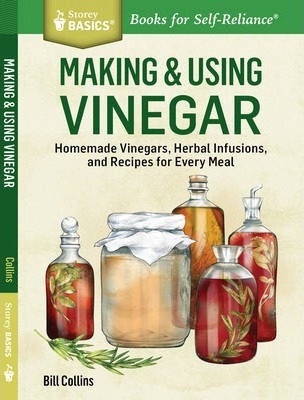 You'll also find information on pickling and a section on the many household uses for distilled white vinegar. Bill Collins is the author of Making & Using Caramel, How to Make Chocolate Candies, Knife Skills, and Making & Using Vinegar. A graduate of the Cambridge School of Culinary Arts, he cooked at the old Ritz-Carlton Hotel in Boston and directed new product development at Harbor Sweets (Salem, Massachusetts) prior to establishing Chef Bill, Inc., in 2001. He has been a professional chef, a personal chef, a food industry consultant, and a cooking instructor, giving classes everywhere from community colleges to Whole Foods to Stonewall Kitchen. As Chef Bill, he has written newspaper columns on kitchen skills. He lives in Pelham, Massachusetts.